Matthew Butler-Hart on the set of THE ISLE. ©Mathew Buttler-Hart. 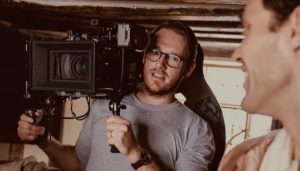 HOLLYWOOD—Married filmmaking team Matthew and Tori Butler-Hart navigate their latest creation with the supernatural thriller “The Isle.” The film opens in select U.S. cities and is available on VOD this Friday. Set in 1846 on a nearly deserted Scottish island, “The Isle” tells the story of a trio of sailors who become shipwrecked along the rugged and frigid North Atlantic coast. They are rescued by an old harbor man, who takes these sole survivors to his only neighbor, a farmer who lives with his shy and mysterious niece, Lanthe. The only other resident of the island appears to be a madwoman, whom the men try to keep apart from Lanthe. Initially, the sailors are promised a boat will come around from the mainland to retrieve them but the longer they stay, the more likely it appears that no such rescue is imminent. The sailors begin to explore the woodsy, rocky island in search of an alternate escape, but soon become caught up in the tragic and deadly mystery of the place, including that of a ghostly siren that haunts it. The independent film was shot largely on location on Eilean Shona in northwest Scotland, a remote island with a tragic history. Matthew Butler-Hart directs the film from a screenplay he wrote with Tori Butler-Hart, who also stars in the film as Lanthe, the beautiful but peculiar niece of Douglas Innes (Conleth Hill, who played Lord Varys on HBO’s “Game of Thrones”). The couple also serve as producers on the film. The Butler-Harts spoke by phone about making their third feature film together, following 2014’s comedy “Miss in Her Teens” and the ‘70’s set thriller “Two Down,” the 2015 film they produced through their Fizz and Ginger Films production company. Q: “The Isle” really takes its time to build the suspense and pull the viewer into this beautiful but forbidding place. Matthew: We’re really pleased with how it’s resonating with people. It’s not the classic jump-cut, slasher horror. Tori: We were very lucky with that. It’s a stunning island in an incredible part of the world, just up the west coast of Scotland. It really is in the middle of nowhere. Matthew: What you see is really what is there. There is no cheating. Everywhere you point the camera on the island, there is just amazing scenery. Tori: We were there for nearly a month and there’s hardly any mobile phone signal, hardly any internet, and there are no roads, so it’s very remote, very cut off, which made it exactly perfect for shooting that kind of period piece. Q: Did the story come before the setting or did Eilean Shona inspire the story? Tori: We were approached by someone we had worked with on “Two Down.” He said, “My family has this island in Scotland. We really want to film something on it. Would you guys come and have a look and maybe could you write something?” Not expecting what we found, we went up there to this extraordinary location, which you have to approach by boat. The BBC had been up there previously and said it’s impossible, so we rose to the challenge. Once there, we started to look into the history of the island. That’s what led up to writing the story that we did because we found what used to be a populated island, but after a food famine everyone left. When we dug a little deeper, we found that a woman had been killed in the schoolhouse. Matthew: No one knew where she came from or who she was. Tori: It was a mystery and that was something we could work with—that female figure that no one knows who she is. Matthew: The famine that had driven everyone away reminded me of the Greek myth of Persephone and the cause of a famine for six months of the year while she was in Hell. So, all these little bits fed into the story. We knew, as soon as we went up there, that we wanted to keep it in the period (of the 1840s) of when things were happening on the island. Tori: Because it’s right on the edge of the Atlantic, we wanted to bring in the idea of the sailors being almost as lost and isolated as the island’s inhabitants. They’re on this treacherous journey to New York. That idea captured our imaginations. Q: How close is this island to civilization? Matthew: It’s not close at all. You have to go up to Port William and then drive three or four hours down a one-track (lane) road and hope you don’t meet anyone else coming the other way. And then little speed boats come and pick you up and take you out to the island. Tori: You can visit it. They run these incredible writing retreats and artistic retreat and camping and stuff. It’s very beautiful. Matthew: If you’re not too scared by “The Isle,” you can have a lovely holiday there. Q: What were the logistical challenges of filming there? Matthew: It was more that we had a small window of time because Conleth Hill had a month before he had to go off to do “Game of Thrones.” Alex Hassell was about to go do “Suburbicon” with George Clooney. The finance guys said they loved the (script) but they wanted these two guys that they’d worked with before in the film. So, it wasn’t just the logistics of going there. We had four weeks to prep the entire thing. Tori: We shot the interiors in another location near the south of England. It ended up being about three weeks on Shona. We had a couple of weeks in Sussex first. The main thing with the logistics was getting the equipment there. It boiled down to quite a lot of the time bribing locals to bring their barge boats in exchange for a bottle of whiskey. Matthew: We were relying on the kindness of strangers as a lot of indie films do. We also had a brilliant crew. When things went wrong—and they went wrong a lot with cables and whatnot—it was just a lot of improvisation to work around it. We had to work quickly because the weather was so changeable. One minute we’d have bright beautiful sunshine and 10 minutes later we’d have a force nine gale. Tori: The crew were great about getting the wetsuits on and getting into the water. Matthew: We explained to them and the actors what it was going to be like—that we’d be in the North Atlantic sea filming on boats that are genuinely sinking. We told them it’s not just a film but an adventure as well. The actors may have fibbed a bit on their rowing skills. But we were lucky, on the whole. Q: Ian McKellen is listed as an associate producer on the film. What is his connection to you? Matthew: Ever since our first short film (2010’s “E’gad Zombies”) that he was in, he’s been a big supporter of our projects. He’s narrated some things. On the last film, he helped us with locations. And with this, he helped us financially. He’s just been a supporter of people doing things on their own. I’ve known him quite a long time. I used to live around the corner from him in my young acting days. So, I got to know him and he’s always supported us. Q: Were the shots of the island’s natural beauty scripted out or did you add those images once you were shooting? Matthew: Since the story is about myths and legends and the location is so much a part of that, I always knew the style, the feel and the pacing I wanted to have. So, in my storyboarding I always was drawing terrible trees and rocks and things like that. People have compared this—very nicely—to films like (Robin Hardy’s 1974 horror film) “The Wicker Man” and the more modern (2015 film) “The Witch.” Part of that is having the island as one of the characters, really. Q: What’s your writing process? Tori: With each project, it dictates itself how we’re going to write it. Sometimes we sit down together from the very first page and plot a story map, and then we sit page-by-page and write all the dialogue together. With “The Isle,” Matt wrote several pages or a couple of scenes and then I would look at that and then write the next several pages. But Matt tends to be very good at writing the description and visual stuff and setting the scenes, especially if we’re doing any kind of action, and I tend to write the dialogue. Matthew: We go back and forth with refining the dialogue. Q: Tori, since you began your career as a dancer, were the contortions of your character in this film performed by you? Tori: Yes. I trained as a dancer and then decided I wanted to be an actor. I still try to keep up with a lot of fitness. I do yoga and I still dance a bit. I’ve also been doing a little more creature work as well, which is an area I’m really fascinated with. So, it was a fun thing to explore. Q: What are you working on through your production company? Tori: We’ve been working on a TV series, which is taken from a sci-fi thriller screenplay pilot that we wrote. It’s U.S.-based so we’re talking to people in America. That’s exciting because TV is a new genre for us. Everyone wants TV at the moment. Matthew: It’s such a big idea involving quantum physics and sci-fi, that we need to do this in a long-form format to explore these things. Tori: In the U.K., we’ve got a drama we’ve been working on which is in the early, pre-production financing stages, which is very exciting. It’s called “Mr. Parker.” We’ve also got a comedy-heist called “Dragheist,” which is about a group of drag queens who seek revenge on a businessman who is taking over and gentrifying their beloved SoHo in London.